Co-workers Stavely Lord and David Hambric both thought it’d be smart to ride their bikes to happy hour on 14th Street last Friday night. The moment they arrived, they realized the problem with this plan: parking. Every rack was packed. And all of the meters and street signs in sight were already sporting Kryptonite locks. The only spot left was along one side of a tree box. Read the full article by visiting the Washington Post page. It’s a glorious problem to have, for sure…also a sure sign that cities need to keep up with growing demands. We’ve talking about this a lot over the years, that encouraging more people to travel by bike takes so much more than painting a few stripes on the pavement. 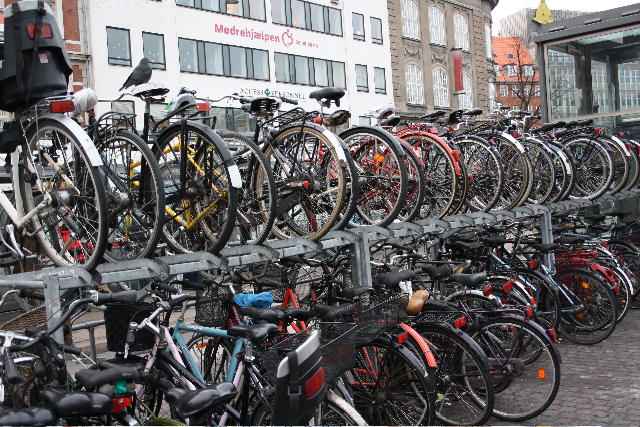 To increase bike share in a city, there needs to be a comprehensive development of related infrastructure, and that includes ample bike parking wherever it will fit!